Can energy usage data tell us anything about the quality of our programming languages? Last year a team of six researchers in Portugal from three different universities decided to investigate this question, ultimately releasing a paper titled “Energy Efficiency Across Programming Languages.” They ran the solutions to 10 programming problems written in 27 different languages, while carefully monitoring how much electricity each one used — as well as its speed and memory usage. It was important to run a variety of benchmark tests because ultimately their results varied depending on which test was being performed. For example, overall the C language turned out to be the fastest and also the most energy efficient. But in the benchmark test which involved scanning a DNA database for a particular genetic sequence, Rust was the most energy-efficient — while C came in third. Yet even within that same test, the “best” language depends on what your criterion is. For that test C also turned out to be only the second fastest language (again, placing behind Rust). But Rust dropped a full nine positions if the results were sorted by memory usage. And while Fortran was the second most energy efficient language for this test, it also dropped a full six positions when the results were instead sorted by execution time. A faster language is not always the most energy efficient. The researchers note that they “strictly followed” the CLBG project’s guidelines about compiler versions and the best optimization flags. Power consumption was measured using a tool from Intel — the Running Average Power Limit tool — with each program executed not just once, but 10 times, “to reduce the impact of cold starts and cache effects, and to be able to analyze the measurements’ consistency and avoid outliers.” (For this reason, they report that “the measured results are quite consistent.”) For added consistency, all of the tests were on a desktop running Linux Ubuntu Server 16.10 (kernel version 4.8.0-22-generic), with 16GB of RAM and a 3.20GHz Haswell Intel Core i5-4460 CPU. In their paper, the researchers call out some interesting results. They also compared the results from compiled languages versus interpreted languages (with a separate category for languages that run on virtual machines). And the paper also includes a separate comparison of the different programming paradigms — including both functional and imperative programming, plus object-oriented programming and scripting. The paper took a hard look at the common assumption that a faster program will always use less energy, pointing out that it’s not as simple as the law of physics that says E(nergy) = T(ime) x P(ower). This is partly because power isn’t expended at a consistent rate, the researchers note, suggesting that may be impacting the work of other researchers investigating whether a program’s running time affects its energy consumption. 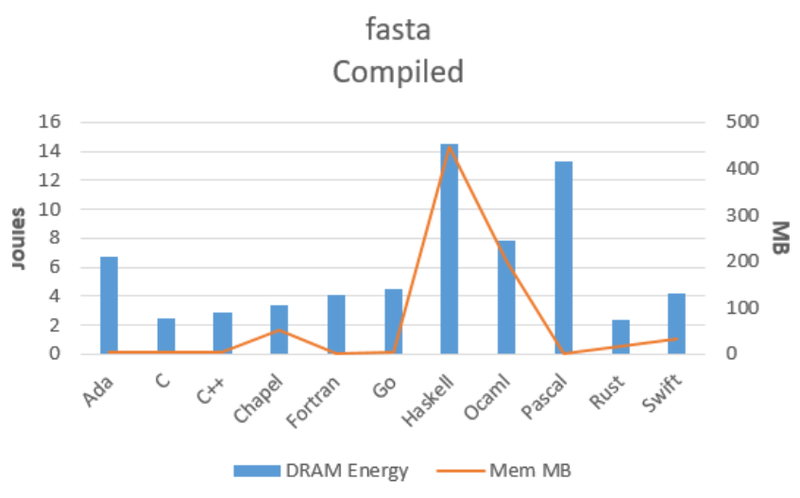 (“Conclusions regarding this issue diverge sometimes…”) In one of their benchmark tests, a Chapel program took 55 percent less time to execute than an equivalent program written in Pascal — and yet that Pascal program used 10 percent less energy. It can be a hard question to answer, since power consumption is affected by many factors (including the quality of the compiler and what libraries are used). But ultimately the researchers were even able to break down energy consumption based on whether it was being consumed by the CPU or DRAM — concluding that the majority of power (around 88 percent) was consumed by the CPU, on average, whether the benchmark program was compiled, interpreted, or run on a virtual machine. Interestingly, interpreted languages showed a slightly higher variation, with the CPU sometimes consuming as much as 92.90 percent of the power or as little as 81.57 percent. And even on individual benchmark tests, there are cases where fast-performing languages are not the most energy efficient. The five slowest languages were all interpreted: Lua, Python, Perl, Ruby and Typescript. And the five languages which consumed the most energy were also interpreted: Perl, Python, Ruby, JRuby, and Lua. 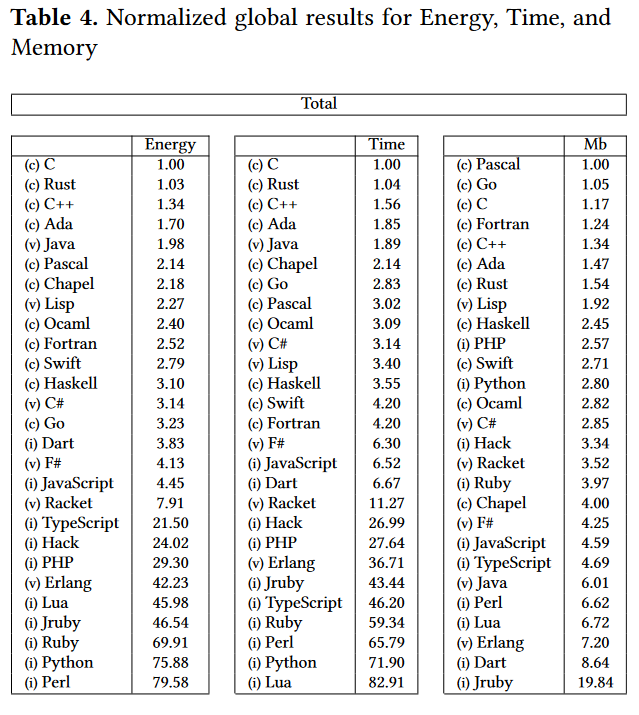 Compiled languages also took the top five slots for least amount of memory space used. “On average, the compiled languages needed 125Mb, the virtual machine languages needed 285Mb, and the interpreted needed 426Mb,” the researchers report. Meanwhile interpreted languages claimed four of the five bottom spots, meaning they consumed the most memory space: JRuby, Dart, Lua, and Perl. (While Erlang is not an interpreted language, it would also appear in the bottom five, between Dart and Lua). In fact, when comparing the different paradigms, imperative programming often came out on top. Its benchmark programs also used far less energy on average — and ran much faster — than the benchmark programs for object-oriented, functional, and scripting paradigms. And some applications require the consideration of two factors — for example, energy usage and execution time. In that case, “C is the best solution, since it is dominant in both single objectives,” the researchers write. If you’re trying to save time while using less memory, C, Pascal, and Go “are equivalent” — and the same is true if you’re watching all three variables (time, energy use, and memory use). But if you’re just trying to save energy while using less memory, your best choices are C or Pascal. At the end of the paper, the researchers add that for further study, they’d like to examine whether total memory use over time correlates better with energy consumed. They’re sharing their data online, suggesting it makes it easier for future researchers to compare, for example, .NET languages or JVM languages. For developers working with mobile applications, Internet-of-Things systems, or other apps drawing from limited power supplies, power consumption is a major concern. But in the end, the study may also leave programmers with the thing they hate most: ambiguity. The researchers report that if you’re looking for a single-best programming language, “this question does not have a concrete and ultimate answer.